An explosion outside a US-led coalition air base in southern Afghanistan has destroyed eight fuel tankers, military and government officials say. 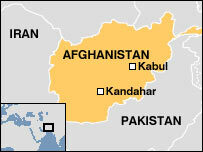 The blast in Kandahar, which injured two people, was caused by a suspected bomb, an Afghan military official said. One soldier said a fireball engulfed the tankers. "I heard a big bang and then a second one. I could see flames bursting out," he told AFP news agency. A US military spokeswoman said the tankers belonged to the Afghan army. The explosions occurred at about 0200 local time on Friday (2130 GMT on Thursday). "Two of the tankers exploded one after the other from mines inside them," Afghan military deputy commander Mohammad Sarwar told AFP. "Six other tankers also exploded and burnt. Two people were injured." More than 1,200 people have died in violence in Afghanistan this year.